Succulent Icelandic cod with a herby breadcrumb topping, served with ready-cooked lentils. This satisfying dish is a healthy, low-fat supper option. Preheat the oven to 200°C, gas mark 6. Place the cod in a baking dish or roasting tin. Mix together the herbs, breadcrumbs and lemon juice and press on top of the fillets. Cover with foil and bake for 10 minutes. Remove the foil and cook for a further 5 minutes, or until the breadcrumb topping is lightly golden and the fish is opaque and just cooked. Meanwhile, in a small bowl, mix the lentils with the salad onions and balsamic glaze. 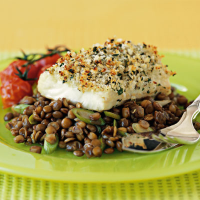 To serve, spoon the lentils onto 2 serving plates and top with the cod and any remaining cooking juices. Serve with roasted baby vine tomatoes. You can prepare the herb crust up to 24 hours in advance and store in the fridge until needed.